Just wondering if there is any actual advantage for PAL PS2 owners to use a component cable over a decent RGB Scart cable? I appreciate if I had an NTSC console, I could potentially see Gran Turismo 4 in 1080i, but it seems that the majority of PAL PS2 games are standard 480i. I think there may be a couple of old games and compilations that run in EDTV progressive mode, but seems very rare (PAL getting screwed over again that generation by Nintendo and Sony, even if they at least finally offered 60hz options in the end....seems only Microsoft and Sega offered 480p with their Xbox and Dreamcast with the high def pack and VGA box). Does component though give a better picture even if games aren't utilising it properly, over RGB scart? Basically whats the optimum way of playing PAL PS2 games on a native PAL PS2? I don't know the ins and outs of all the tech speak but my eyes say that component looks better than RGB. I will provide the caveat that i used a 3rd party RGB scart cable, so perhaps that may be a factor. That cable seemed good quality though, i even used it on my PS3 before i got a flat panel. Also i do use NTSC as well as PAL PS2's so get the benefit of the improved resolution but its mainly for convenience as i can just switch out the base unit and use the same AV/PSU leads. If you like i can take some proper comparison shots when i get chance. I think the picture definitely looks sharper when compared to RGB so I would recommend a component cable if you can make use of one. In to Retro Gaming Pickup's? Light hearted reviews of both Modern Day and Retro Video Games? Check out my YouTube Channel! Thanks for your responses, but i believe you are both breaking my made up rules here! I'm talking about on a standard LCD small Sony Bravia (no additional scalers), which has component and scart sockets, and the fact that PAL PS2 games will only run at a maximum 480i or 576i.....will it make any difference on using component or scart? They're both analogue signals (its not like component cable is digital like hdmi). I guess my question is....480i on component vs 480i rgb scart. Is there a noticeable difference if both cables are decent quality? I don't think it's as clear cut as one being definitively better than the other - depends on the build quality of the cable, the TV you're using it on, etc. I have tried both on my Ferguson LCD - component looked slightly crisper but the TV can't handle 240p through it so PS1 games and a few PS2 titles (mostly Ignition's SNK-licensed stuff) weren't playable. Both 3rd-party SCART cables I have available displayed more vivid colours but suffered from ghosting, most likely due to poor shielding. Liamh1982 wrote: I don't think it's as clear cut as one being definitively better than the other - depends on the build quality of the cable, the TV you're using it on, etc. Interesting point about PS1 games on it. 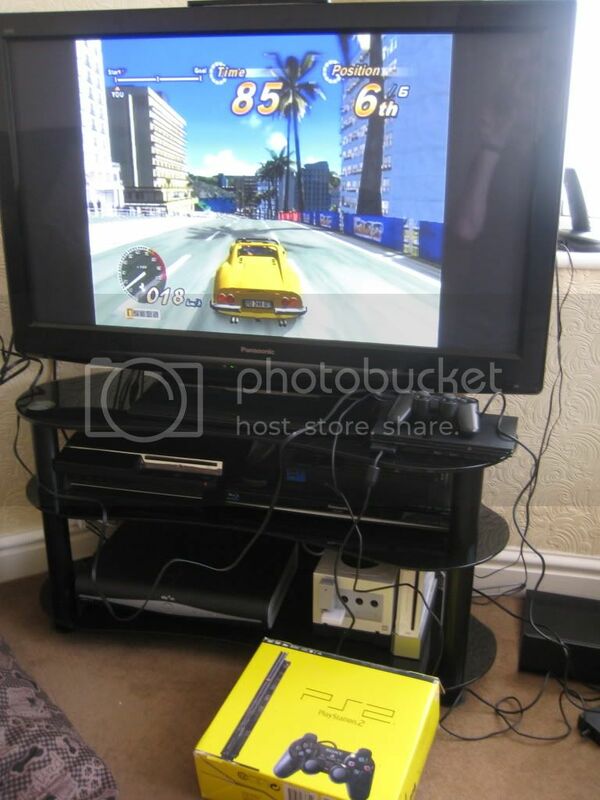 So running PS1 games on your Ferguson LCD that you mention through a scart cable on your PS2 is ok though? What resolution does rgb scart run at? Since when you connect in an hdmi or component cable into any modernish TV, it shows the resolution (480, 720, 1080 etc) in the corner. However for any scart input, it doesn't register the resolution. Yeah, PS1 games run fine on my TV through RGB SCART, aside from the ghosting (which strangely doesn't appear when I use the same cables on my chipped PS1 - your guess is as good as mine!). I do too. I just wondered what the optimum picture setup might be for the PS2 on native PAL hardware without modifications. I suspect there may be a difference, but it is probably quite insignificant, as they're effectively running at the same resolution. When you compare HDMI cable to component cable at equal 720p there probably isn't much in it, but logically there could be since HDMI is a digital signal, where as component is analogue still. With scart and component they are both analogue so I do wonder. Not sure how i'd know if its RGB wired or not I'm sure at the time I would have purchased one, since I knew they were the scart cables to get, as I found out during my 16 bit days. But i suppose there is a chance its not. PS2 component cables can be under a fiver on ebay at the moment. They're cheap, but i think its because for PAL users there isn't that much point in getting one. It seems quite attractive if you have a NTSC PS2, but with the PAL version, it will only actually work on 480p on a very small handful of games. I suppose it might be good if you want to free up a scart socket. I got a £5 PS2 component cable from Amazon recently, to see what Outrun 2 and Gran Tursimo 4 looked like. Using the PS2 on a 40" Samsung LCD the picture and text was a lot clearer than the standard scart cable. Considering the cost of the cable, can't see a reason not to opt for component. GAME have a 3-in-1 component cable that also works on 360 and Wii. I got one for £8 although they're usually priced at about £13-15. Build quality is decent and picture output for all three systems is more than satisfactory. Useful if you're short of inputs on your TV. Liamh1982 wrote: GAME have a 3-in-1 component cable that also works on 360 and Wii. I got one for £8 although they're usually priced at about £13-15. Build quality is decent and picture output for all three systems is more than satisfactory. Hmmm, that could be worthwhile. I wouldn't use it for the 360 (even if it wasn't connected to another telly anyway), because i'd want it going through HDMI to give the optimum picture. But certainly running component on the Wii and PS2 in one cable sounds ideal and relatively inexpensive. Especially since most LCD tvs only have one bank of component sockets, compared with usually multiple scart and HDMI ports. I'm just not entirely convinced about the picture benefit. And also, using PS1 games on my PS2 is an absolute must. Although I think this specific TV would probably be able to cope, since it runs PAL Wii virtual console games (NES and Neo Geo games), that other TV's throw a tantrum at. This is the advantage of having an LCD tv from last decade!